Ivory White AMZCHEF ZM1501 is a brand new number one release, slow masticating cold press, multi-purpose juicer extractor with a quiet motor and a sleek and humanized design for juicing a variety of fruits and veggies by ZG Kitchenware. AmzChef Slow Juicer has an impressive average score of 5 out of 5 stars by 8 customers at the moment and shows the quality, ease of use and functionality of the product. Customers that purchased it are generally happy with the results- highly nutritious and tasty fruit and vegetable juices with much less oxidation and longer shelf lives. You can juice apples, carrot, pears, ginger, leafy greens and wheatgrass with this great multi-purpose juicer. It is easy to put together and start using straight away and clean after each use. You can enjoy your healthy juices with different mixtures and flavors every single day. It has a small feeder chute to help avoid any injuries and a unique juice storage cup panel that will also help with easier cleaning after use. 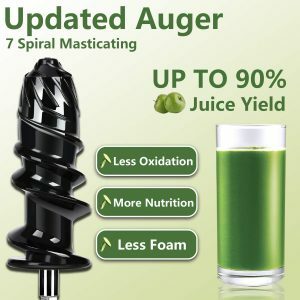 The juice yield is reported to be higher than normal- up to 90% with this masticating juicer with a 7 spiral updated auger that runs at a low 80 rpm rotating speed. With no or very little damage to the cell walls, the healthy nutrients- vitamins, minerals and enzymes will be maintained better than with the fast centrifugal juicers. It runs quietly at a noise level of less than 60 decibels. The safety lock design will help you assemble and disassemble the juicer in just a few minutes. It helps prevent clogging or the bits stuck inside with the Reverse function and this is good for easier cleaning. All parts other than the base motor can be cleaned in the dishwasher. BPA-free food-grade Tritan anti-oxidation materials with excellent corrosion and heat resistance are used on all the removable parts of this juicer. The food grade 304 slow juicer filter has many small holes to help get much purer juice than normal. You can peel the skin of fruits before putting them in but it is up to you how you want the juice. Ivory White AMZCHEF ZM1501 is a little heavy- weighs 9.82 pounds and measures 15 x 7.7 x 11.8 inches. You’ll find two cups included with this juicer, a very large 1 liter cup for pulp storage and a 700ml juice cup. It has a 150 watt motor that works at 80rpm speed with 110V voltage and 60Hz of frequency. If you want to juice things like celery, you may want to first cut them up well and feed them in slowly and when the pieces get stuck, simply use the Rev button. And it shall work out fine- celery will get juiced successfully. 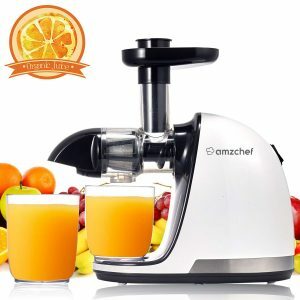 AmzChef has a nice and modern design, is easy to operate, makes juice smoothly and quickly, runs quietly, generates totally pulpless smooth juice with a lot of healthy nutrients, is easy to clean and is sold at a fair price. It is great value for the dollar overall. You’ll get a decent warranty of two years, one month free trial and technical and customer support for the life of the product. And you may contact them via email or phone in case you encounter any issues with the juicer, and they will be happy to help. You’ll get Amazon technical support free of charge included in the package.